For one reason or another, Ender's Game wasn't really on my radar in the run-up to its release. Though hotly anticipated amongst fans of the books, it did have the air of a film that's on trajectory for that gulf of "Well, that happened", somewhere between a Star Wars knock-off and a Harry Potter wannabe. Unfortunately for those who revel in snarking about that kind of failure, this is actually pretty solid. In the future, mankind is shaken by a devastating alien invasion by a race of insectoid beings, known as the Formics. Ever since, the military forces of Earth have been trying to figure out a way to both prevent and fend off a future attack, exploiting the intelligence and imagination of children to develop strategy. Ender Wiggin, one of the most promising young recruits, quickly ascends through the ranks in the course of his training, on his way to finishing the war forever. That so many of the positive reviews of this film have begun with a disclaimer about the homophobic views of Orson Scott Card is probably lip service that the all-around bad guy in this production story does not deserve. He wrote this hugely influential book, and its subsequent sequels, and by all accounts, the film version has finally got to the big screen despite his spending the last 20 years trying to get a version there. And as enjoyable as it is, the finished film comes from an unlikely writer-director- Gavin Hood, coming off the back of 20th Century Fox's disastrous X-Men Origins: Wolverine. If this is a fairer assessment of his skills as a blockbuster director, then I could stand to see more from him, even if my final analysis would probably be that the film goes big in certain places where it should have went smaller. In the main, however, it serves as a surprisingly fleet-footed adaptation of a story that might have ran into the similar problems that befell Andrew Stanton's recent film version of John Carter. But despite the way in which this influential genre piece has been strip-mined in other texts ever since it was published, this at least has an appearance of freshness about it. 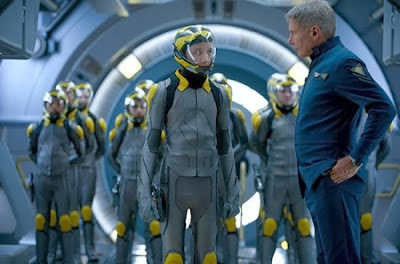 Carrying the film, to great effect, is Asa Butterfield as Ender. He's a great young actor, as demonstrated in The Boy With The Striped Pyjamas and Hugo, and he has a lot to do here, as the boy who's simultaneously manipulating his surroundings in order to protect himself and the things he cares about, and being manipulated to wage war by a higher power. He seems to abhor violence, and yet he's methodical in doling it out in order to prevent future conflicts. It's a tough internal conflict to portray, but Butterfield does a formidable job. Hood evokes memories of Paul Verhoeven's Starship Troopers in the scenes where Ender trains with his fellow young soldiers, and that's surprising enough for a 12A actioner- it doesn't have much of a satirical edge, but it does have more of a sense of humour than The Hunger Games, a film that built a terrific sense of misery and foreboding, but never showed its cheekier side before rallying for seriousness as this one does. 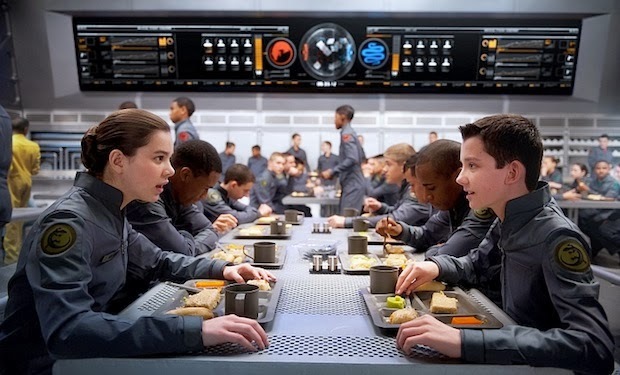 Ender's Game has the benefit of a more rounded cast of young characters, led by an admittedly underused Hailee Steinfeld, and antagonised by a scene-stealing Moisés Arias, who is extremely watchable as a five-foot-nothing sociopath. At the sidelines, Harrison Ford and Viola Davis mentor the kids and grumble at one another about the potential pitfalls of manipulating children to fight their war. Davis doesn't have an awful lot to do, but Ford is really awake at the wheel in this one, however scowly and mumbly he may seem. There's also a late intervention by Ben Kingsley, in which his broad Kiwi accent keeps you from laughing at his slightly preposterous facial artwork. All around, the cast do pretty good jobs, which makes me think that it might have been better to lean upon them more, rather than go all-out on CGI. It's a $110 million movie that probably could have been even more effective for coming in under $100 million at most. There's some ingenuity in the zero-gravity training sequences that Ender and his pals go through, but whenever spaceships enter the picture, it becomes less visually interesting. For instance, I'm writing this review without spoilers, and without revealing the infamous twist in the story, if only because the film works so well for people who haven't had the chance to read the book (or the misfortune to hear of Orson Scott Card) and pulls off an impeccable execution of that twist on screen. However, the way that the CGI is used in the battle sequence that immediately precedes this twist almost serves to deliberately tee up what should be a real sucker-punch, when a less bombastic sequence would have done just as well. Although Ender's Game comes from a much larger series of books, it doesn't seem to have any outward pretensions of starting a franchise, not least because nobody could blame Hollywood for wanting as little to do with the series' author as possible. As a result, this comes out as a thoughtful and enjoyable adaptation, which has plenty to offer kids and adults, precisely because Hood's approach understands that accessibility is paramount in adaptation- it even manages to get through its obligatory made-up words and concepts without too much over-explanation. Even if I feel that it's bigger than it needed to be, it's not ugly-big, and the scale of the thing never dwarves its themes, which feel just as relevant today. Ender's Game is now showing in cinemas nationwide. 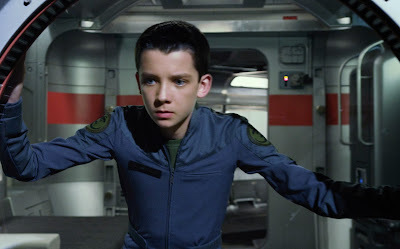 If you've seen Ender's Game, why not share your comments below? As much as I like Butterfield and Steinfeld, Moisés Arias is swiftly becoming one of my favourite child actors- have you seen him in The Kings Of Summer?